Cycling Mt. Wellington: Ride 17.6 km gaining 1,156 meters at 6.6% average grade. This climb is on the Australian island state of Tasmania. Tasmania is home to the first environmental political party in the world and 42% of its land is some form of protected land. This bicycle climb is almost entirely in Wellington Park (617 acres established in 1993). We begin the climb a short distance west of Hobart (pop. 229,000, the largest city and capitol of Tasmania; the smallest but second oldest Australian state capital). The 23 km climb starts at the edge of the CBD in Hobart. As such, traffic is heavy. Combined with the general disregard for cyclists on Australian roads, riders have to be on the defensive. The traffic lets up the further into the climb you go. This reduces the frequency of stress, not the magnitude. Having said that, we received congratulatory greetings from a number of people as we strolled around the summit area. At the Cascade Brewery the CBD is left behind and the suburbs start with a constant 5% +/- grade. With 12 km to the summit you turn into the park area and the grade becomes relentless at 10% with little variability in the slope. They have painted kilometers to go signs on the road. I presume for the cyclists. If nothing else, the marks provided a strange sense of enjoyment. We climbed Mt Wellington on a day that started overcast with heavy smoke from the bush fires burning in south western and central Tasmania. As the day progressed, the sun began to shine and the smoke dissipated. The photos reflect the changing environmental conditions. Nasty smoke at the outset. Smoke cleared a fair amount by the end of our bike climb. 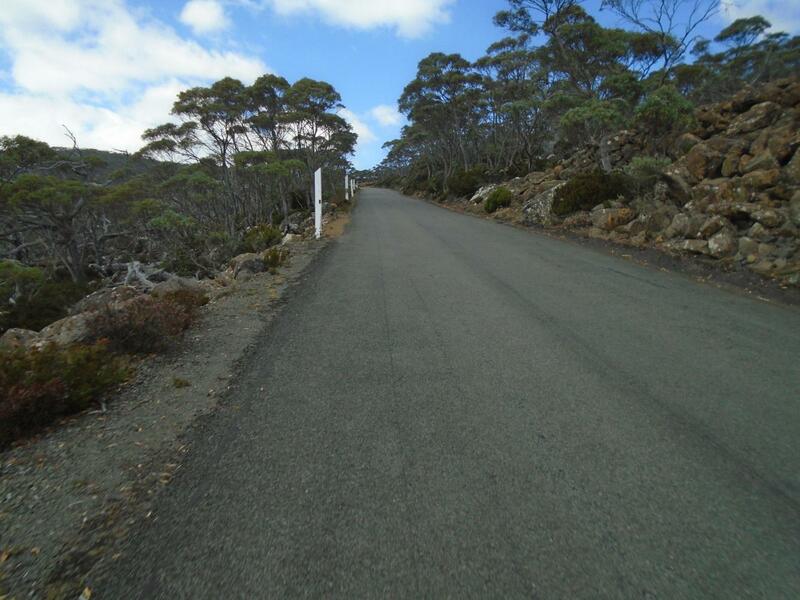 We have climbed steeper grades and we have climbed longer climbs, but we have not been on too many climbs that combined each to the degree of Mt Wellington. Cycling Mt. Wellington - the only PJAMM Cycling bike climb on the Australian island state of Tasmania.